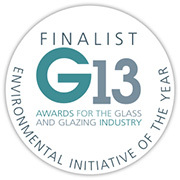 We are delighted to announce that the manufacturer of ClearShield were short-listed for the G13 Environmental Initiative of the Year for their new ClearShield Eco-System™. The new System was recognised by the award judges as having significant environmental impact for reducing energy requirements and carbon emissions for the routine washing of architectural glass by up to 50%. In addition, the system can help renovate glass to its original state which reduces environment impact of replacing the glass with a new product.